Yesterday I read an article on the BBC that set me to thinking. The article was titled 'Can an English Suit be made in Cambodia?' The article is about the suit the England football team will be wearing for formal dos during Euro 2016. The design is British, the cloth is British, but what about the rest? This is a fantastic diagram to demonstrate the complexity behind creating the suit. And this is just tracking one material: wool. What about the things that are made from more than one material? I'm currently writing this on a Macbook made from hundreds, if not thousands of different tiny components; from screws to microchips. 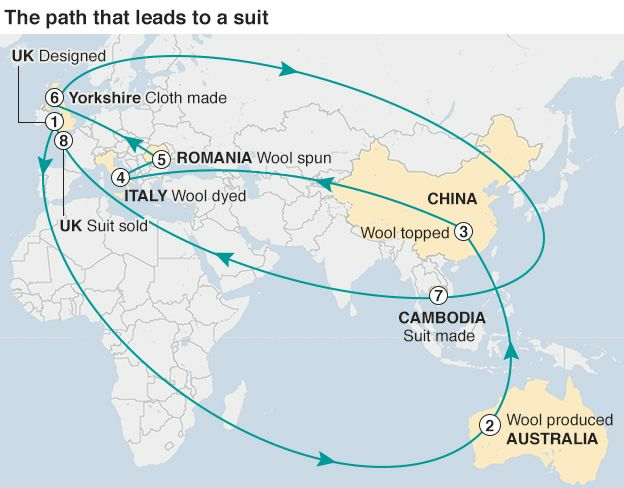 Each component is likely to have made a journey similar to wool in the above diagram, the raw material originating in one country, refined in another, shaped in a third and put together in fourth. For complex products like electronics it might be nearly impossible to trace the journey each part has made from raw material to functioning smartphone, microwave or TV. This difficulty in knowing where things come from is a massive challenge for sustainability. If we can't trace an item's origins, then we can't know if it was sourced responsibly. The more items a final product is made from, the more complex this supply chain is until we have no idea if the copper mined for my laptop came from the US, Chile, Zambia or Poland. The fact that we're using complex products with complex supply chains is not in itself a bad thing. However this complexity can hide issues that can create sustainability problems. The same raw material can be sourced more or less responsibly depending on the location (the same can be said for the raw material's refinement, transport, assembly etc). Not thinking about the lifecycle of our products and the potential harm therein is a problem. And that's where I think craft helps. I make simple wooden items straight from freshly cut wood. All the wood I use comes from less than five miles from where I make the items. The wood is from local trees removed only because of insects, disease or circumstance. I shake the hand of the person that cut down the tree and can show people where the cherry tree their spoon came from once grew. Using this kind of local material and teaching other people how to make a simple practical item from a raw material they can understand the origin of helps to spark the conversation about the wider issues outlined above. The complexity of laptop can leave us overwhelmed, but starting with something as simple as a wooden spoon can help lay the groundwork for trying to understand where other products come from. Many crafts can easily trace the origin of their raw materials, and by learning the skills to make the products that surround us we gain an appreciation for the difficulty involved in making other, more complex, items. Hopefully this understanding will lead to people questioning the impact of the items we use in our everyday lives.